DARIEN — Many children in Darien know that Santa Claus works at Wild Birds Unlimited on Heights Road. Joe Warren, owner of the shop, sports a long white beard trimmed by a woman in Hartford who specializes in cutting Santa Claus beards. On his finger is a silver ring engraved with the word “Santa” to convince children he’s the real Saint Nick. He even has a spare should he misplace it, all to keep alive the role he’s been playing at holiday events around town for over 40 years. Now 71, Warren started playing Santa by accident when he was in his 30s. It was Christmas time and his wife’s office holiday party was approaching. His wife worked at Cannondale, which had just purchased a stitching company in Pennsylvania that sent them a Santa suit the owner had made for an ad. Warren played Santa Claus for the party and kept the suit at the end of the night. Warren started out with small engagements for churches and the firehouse. After several years, he was approached by the Darien Sport Shop owners — Warren knew the Zangrillo family from growing up in town — to play Santa. His first year there, he posed with about 50 kids for photos taken with a Polaroid camera over the course of three two-hour shifts. Now, Warren does about 50 hours at the Sport Shop each December and last year took about 850 pictures. This year, he has already booked 41 events in addition to the 50 hours he commits to the Sport Shop. Eight years ago, Warren tracked how many children he saw in a season and it surpassed 4,000. 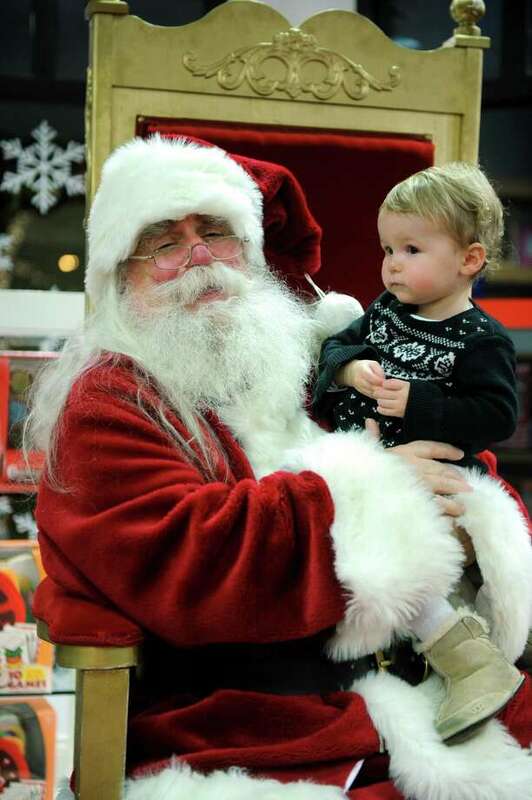 About a decade ago, one woman came for a photo with her infant and said she would put the picture in a scrapbook next to her own picture with Warren as Santa. This extends into Warren’s own family. Warren played Santa for his own two children and now does it for his grandsons, ages 5 and 8. Warren tries to maintain the same separation when children recognize him around town. If they ask why he’s there, he tells them his elves are making toys and he’s there to keep an eye on their behavior. But if a child just gives him “the look,” he just smiles and puts a finger to his lips. “Their eyes get like saucers because now they have this huge secret,” he said. Despite attending Santa conventions where he said he and other Mr. Clauses swap “war stories,” Warren said children are mostly amicable even when making extravagant requests for large Lego sets, puppies, ponies and even once, an alligator. No matter what the children request though, he always makes them promise if he does his best to bring them what they ask for, they’ll be happy with their gifts. Sometimes the role requires dealing with more delicate topics like death. Warren said he’s had children ask for relatives who’ve died to return for the holidays. Warrent doesn’t get paid for his appearances and pays for his own costume, including a new suit every four years, which can cost up to $4,000. Instead, he asks people to give donations to the Noroton Fire Department where he’s been a volunteer for the past 50 years. He raised $8,000 for the department last year.